option should not be needed. Ceti-2 is the official continuation of Ceti for Gnome 3.14, 3.16 and 3.18. It has been completely revamped and is now based on Vertex. Derivatives of these distributions should work, aswell. If your distribution is not listed, please check the requirements yourself. Important: Remove all older versions of the theme from your system before you proceed any further. 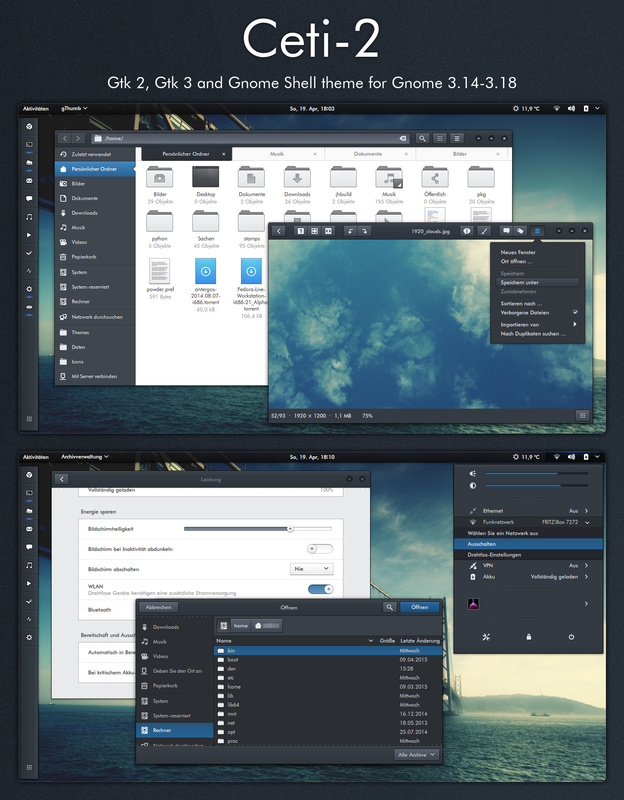 If your distributions doesn't ship separate development packages you just need GTK 3 instead of the -dev packages. After the installation is complete you can activate the theme with gnome-tweak-tool or a similar program by selecting Ceti-2. The extra directory in the same directory as this README resides in contains a Chrome/Chromium theme and an alternative metacity theme, which hides the window titles of maximized windows (doesn't work on Gnome 3.16 and up). To install the Chrome/Chromium theme go to the extra/Chrome folder and drag and drop the Ceti-2-chrome.crx into the Chrome/Chromium window. The source of the Chrome themes is located in the source "Chrome/source" folder. To install the alternative metacity theme, copy the Ceti-2-alternative-metacity folder to /usr/share/themes and select it as window theme.